Congratulations! You win 38 bonus points with this purchase! This is the first time i have used your website and it most definitely will be the last. Infact if i could give you 0 stars rating i would much rather do that. I ordered some prescription contact lenses from your site, with standard diamater selected from your website. Maybe it was wishful thinking but as with any normal shop I was expecting to recieve 1 pack of contact lenses with the same diamater, however I did not and recieved 2 different sized contact lenses - 1 smaller than the other. When i was wearing them it cuased me great discomfort as the smaller one kept falling out and moving around and became very itchy. However, since you seem to advertise great customer service I both emailed and then rang customer services and spoke to someone regarding this issue I was told one on the phone you cannot refund opened boxes even if t he product is faulty but will replace the item for correct size which is what i paid for. However i was angry then to get an email saying this will not happen and you cannot do anything about the faulty product I just have to buy new pair? But this is clearly outrageous as when you order shoes in size 5 - but then recieve 1 foot as size 5 and 1 foot as size 4- that doesnt make sense and clearly the company has to provide you same size like what you ordered? This is complete utter rubbish and i will leave as many negative reviews all over internet and everywhere to inform people what a rubbish and useless company you are who provide faulty products and refuse to refund them. Highly recommend these lenses, comfortable to wear, subtle colour on top of Grey/blue eyes, could possibly go bolder next time. I´ve been using Freshlook lenses for many years and I am very satisfied. The Vibrant Views ColorBlends (Brilliant Blue, Gemstone Green and Sterling Silver) are absolutely amazing. I have dark brown eyes and they show up amazingly! They look really natural (just not on me since I'm asian) and definitely last comfortable for the month for me. My eyes are a bit red by the end of the day but I spend my day looking at boards in class, computer screens, phones and NEVER put eye drops in and they are still comfortable for the day. If I wasn't so lazy and actually put eye drops in, I'm sure they'd be fine (I have naturally dry eyes anyway). I really enjoy wearing them - was suppose to wear them on special occasions and couldn't stop. I'm new to these lenses, feel I may take a while to get accustomed, but they work ok, although i've probably picked a colour too near my own (turquoise)to be noticeable, but that's my fault. Would happily try a pair in brighter blue in future. I am familiar with the brand of these lenses but for the first time I ordered this exact color. Honestly I am a bit disappointed of the color because wearing lenses it becomes much darker. My main idea is to correct my eye sight since I wear dioptric ofcourse but I would also like to know in advance how the color would fit to my natural eye color. May be if there is an example chart in the web shope before complete the purchase would be helpful. daily, slightly uncomfortable at the begining of the day or end of the day, I guess depends on how tired the eyes are. Really like these contacts. I have dark brown eyes and these look pretty good on me. I would say, though, that they are quite big. I have since tried the Freshlook One Day contacts and they are a much better fit for me personally, but in general, this is a good product. FreshLook ColorBlends (2 lenses) – dioptric. 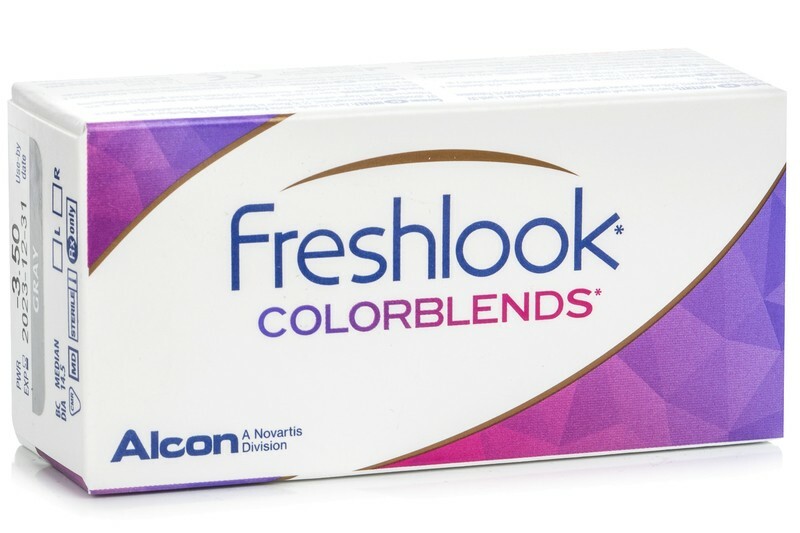 Some of the most popular coloured contact lenses on the market, FreshLook Colorblends dioptric lenses from Alcon are comfortable to wear, correct vision, and enhance natural eye colour. Customers who bought these lenses also bought ReNu MultiPlus 120 ml with case. Hi I ordered these lenses but they just stung my eyes so much and burned? I dont know what to do, is there anything brand of coloured contact lenses I could try? I don't know why they sting so much but its wasted my money as I cant wear them... the daily colorbends don't sting my eyes so why would these ones? I'm glad you enjoy Freshlook Colorblends! If I purchase monthly lenses, would it come with contact lense solution? Not unless there's an offer going on at the time of purchasing. At the moment we have a few different solutions available for free, if you have enough bonus points. Can you send us one e-mail at info@lentiamo.co.uk to explain exactly what happened? are these for 2 months..1 box? They are monthly lenses and if you have the same parameters for both eyes, one box would last you 1 month. Hi, i just noticed that i received the only daily wear in my last order. (written in the box) Hope it was just a mistake from you. Thank you to get any feedback. I am afraid I don't understand exactly what you mean. Can you, please, send us an e-mail at info@lentiamo.co.uk with more details? Hi, If you don't have a prescription you need to select the strength as 0.00. This will make them only cosmetic lenses. Thanks! hi. for how long these lenses can be used? 1 month or three? Hello, These can be used for one month only. Thank you! Hello, These are monthly lenses. Thank you! Hello, Do you get 2 lenses within the box thanks. Hello, Yes, there are two lenses in each box. Thank you! Thank you for your question. The power means the diopter of your eyes when comes to dioptric contact lenses. They are produced to correct eye problems. Do you have to buy a separate box per eye or does one box contain both? Hi, do these come without a prescription? Hi, do these come without prescription? Hi, Yes! You just have to put the power at 0.00! Thanks! Hello. I have question my lenses diameter is 14,2 and 8,5.But I can't find nowhere my size? I would like gamstone green lenses. Thank you. Thank you so much for your comment. These parameters come as they do by defect from the manufacturer. If you tell me the brand you have been using, I can find them for you, but for these coloured lenses, these are the parameters. In fact, we do not have coloured lenses with 14,20 and 8,50. In any case, if you have tried these lenses before then there is no problem. These parameters are not such a big problem when the difference is small, but it is always good to ask your optician about this. If you have more queries, do not hesitate to contact us. Will I get the solution with my contact lenses? what solution should I buy with these? Dear, these are monthly lenses so once they are opened, they can be used for 30 days. The expiration date means that you can store them until that date, if they are not opened. Hello, I want to buy the pure contact lenses but I'm a bit confused. Are these monthly contact lenses or can I reuse them till 2016 because the the expiration date says 2016? First of all, I'm really happy with the customer care team. It makes me feel happier with my future purchases. I'm using Sterling Gray color on my brown eyes. It looks pretty nice in the evening and generally in the environment, where there is a non direct sunlight. So if you would like to have a dramatic change of your eye color, I'd recommend Sterling Gray. Thanks. sorry , one box contain 2 lenses ? i would like to buy but i need that information . Yes, 1 box contains 2 contact lenses. It's difficult to provide an advice without having examined you. Please get in touch with you optician who will be able to help and can provide a trial pair as well. How many months I can use the lenses? Hello, these are monthly lenses. Once open, they can be worn on daily bases and discarded in 30 days. Hello, The final effect depends on the colour of your eye. As you can see from the pictures provided on this page, some shades are more vivid then the others but the final effect is changed according to your eye colour. These FreshLook lenses are monthly once which means once opened, they can be used for 30 days. I wanna know how many times I can wear this type of contact lenses? Which solutions can you use with this contact lens? All the solutions I have seen on your site are for soft contact lens. Is this a soft contact lens? These are soft contact lenses and all the solutions on our website are suitable for these lenses. Thank you very much!!! I really really like the these contacts! The colour I ordered is sterling grey and it lokks amazing! Thanks again for everything! sorry is it for whole year ? These are montly lenses, it means once opened, they can be used for 30 days. Used before and I love them. Very comfortable . I've tried the Freshlook Colorblends in green and gemstone green. Regarding the green ones, they look quite natural on my very dark brown eyes, and matched my Asian complexion well. The gemstone green zombified me a bit. Naturally, what the contacts look like will vary from person to person, so don't be put off by what I write. In terms of comfort: these contacts are very wearable. I soak mine in OptiFree Pure Moist solution and that seems to condition them well. One thing I would say about the Freshlook Colorblends is that the hole for the pupil is quite large, so in bright light the dark brown of my irises show through and contrast a little more than I would like. I have also tried the Freshlook One Day (green) contacts, which are slightly smaller - both print area and the pupil hole. These fit me perfectly, as I haven't been blessed with massively huge irises. I would recommend both types of contacts, but if your irises are smaller, I'd go for the One Day option. Thank you for your invaluable feedback. Much appreciated. Dear, We have coloured lenses in two sections – dioptric (with prescription) and non-dioptric (Plano, with no prescription needed, 0.00 power). Head over to https://www.lentiamo.co.uk/…ioptric.html to see lenses you are looking for.